A couple of new gals have moved in on Vera Lane! The set is called "Besties" and they are ready for instant download in my Etsy shop. Right now we are running a 25% coupon off of a $7.00 minimum purchase. Use coupon code: JULY4TH at check out. Coupon will run through July 11th. I have a love-hate relationship. I'm loving summer right up until NOW! Arizona summers seem to last forever. We will be entering "monsoon season", which admittedly can be fun with beautiful skies. However, with added humidity and temps on the rise to 115 plus, the outdoors is not to be enjoyed for too long. 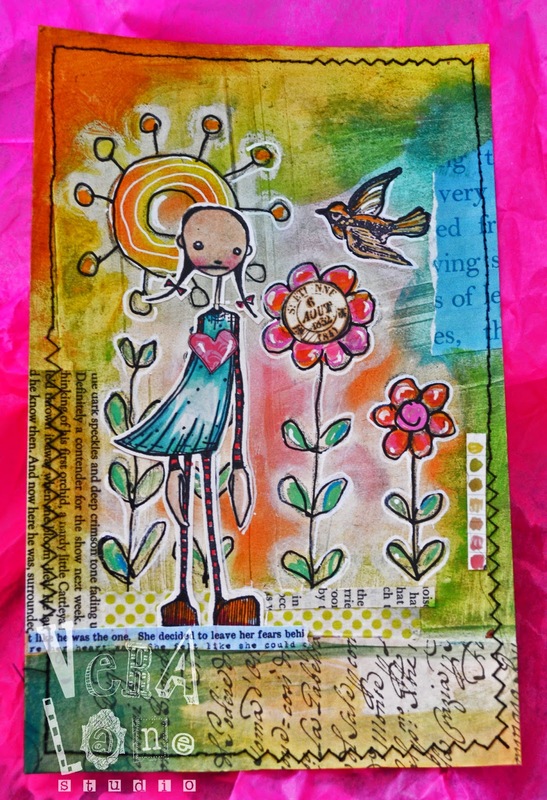 My love-hate Arizona summer feelings gave inspiration for this mixed-media piece. 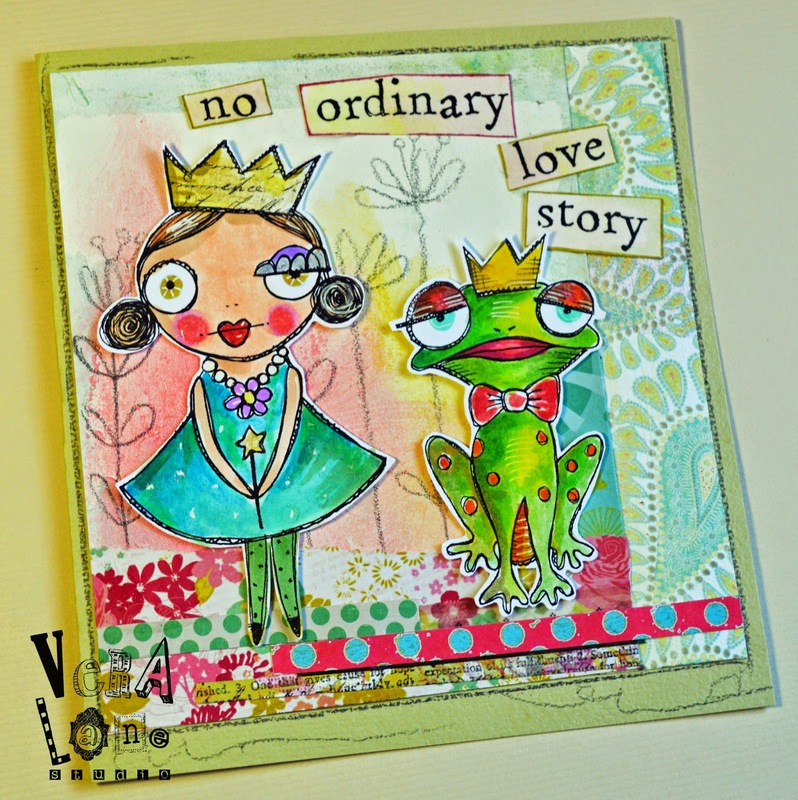 Stampotique's Mela and Little bird are featured in this journal page. I began with a light application of gesso, applied with a credit card. I smeared Gelatos into the gesso and intensified the color with an additional layer of Inktense brushed roughly with a stiff damp brush. My sweet husband bought me Posca pens which led to my doodles. I loved how they took the surface. My signature scrap bits and stitches complete the background. I used a white wax crayon to work around the edges of the images to create the intensity of the summer sun. I made Mela's heart a little larger with some scrap paper to accent "summer love." The Big Bad on Vera Lane! Lil' Red (Riding Hood) and (not so) "Big Bad" have arrived on Vera Lane. Quirky and right up your digital alley. Great for art journals, cards, ATC'S, and other paper crafts. This versatile six image set is available now in our Etsy shop for instant download. You can download this set immediately after purchase. Resized, arrange and print. If I must say so myself, "Big Bad" is just about the cutest little character to appear on Vera Lane! Someone familiar will be arriving on Vera Lane early next week. Who could it be? Stay tuned and check back. It's a big birthday weekend for my hubby, so I know I will enjoy my weekend. I hope you enjoy yours! I have a mobile groomer outside my home working on my Labradoodle Phoebe. The little guy, Humphrey, is howling up a storm. I'm having a hard time putting this simple idea together, but "random acts alphabet" came out of the drawers this morning and I'm sticking with it. 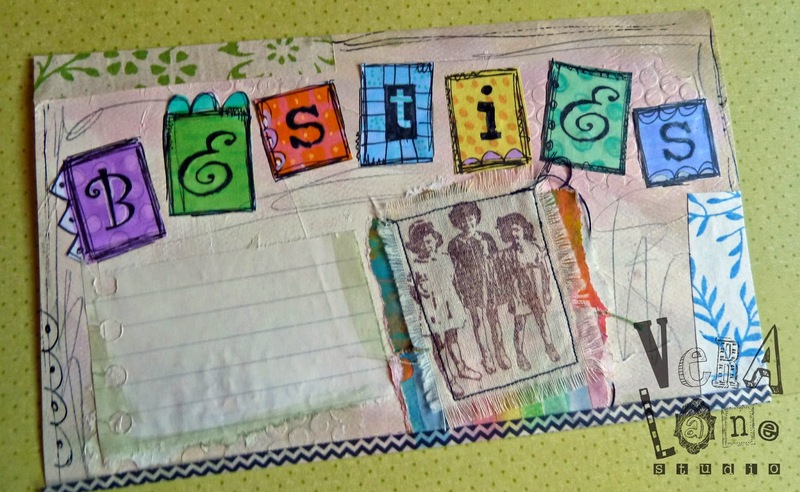 I gessoed my journal page and used two shades of pale taupe to color the background. When dry, I applied Victorian Velvet Distress stain aground the edges. I spelled out "besties" on copy paper and soaked the surround of each letter with Copics. I used Bic water based paint pens and Pitt pens to accent. "Little friends" was stamped with coffee dye ink on tea stained muslin. The image was stitched to scrap paper. Graphite pencil scribbles are added to the negative space. Scraps are added to help anchor the composition. Finally, I added a little piece of ruled paper for a journal entry. I'm going to keep on playing with these letters before I put them away. This is for all the gals out there who have given up on a personal love story. Good guys are still to be found, but you have to look past your expectations. Your prince may be closer than you think, warts and all. "Kiss the frog" is a three image set that is available for instant download in my Etsy shop. All three stamps are used in this sample. They were sized in MS Word, printed and colored with a combination of Inktense blocks and Copic markers. I like to use contrasting patterns and color scraps to create a background. "Kiss the frog" is perfect for art journaling, invites, wedding anniversaries, engagements, or just a reminder of your special love story. I hope you enjoy this image set. My two for one special ends this Sunday at 6 p.m. Arizona time. You must email me with your request after purchase. 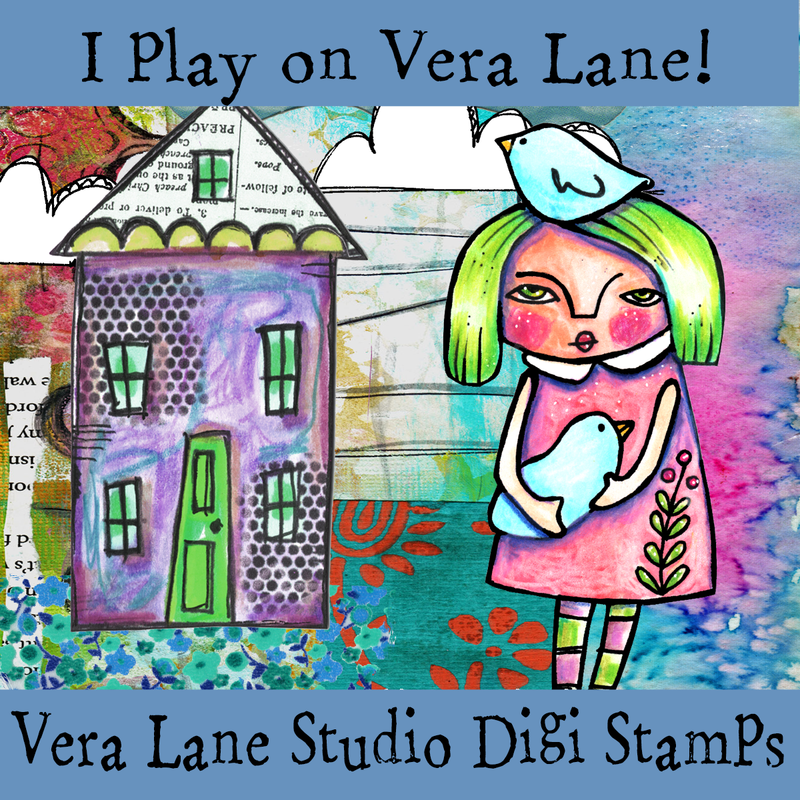 Check my shop for weekly additions for Vera Lane Studio. Verdette is from the most resent Stampotique release. She stands demurely with her hands positioned to create a heart. She's a daughter, a mother, a sister, a sorority girl, a bridesmaid, or a bride. She becomes any gal you wish for her to be with paper piecing and or a hair trim. Today Verdette is the girl in a pretty dress. For the background I applied acrylic paints with stencils on the Gelli plate adding collage scraps face down to the plate. These pieces had glue on the back, and adhered to the printing paper with the printing process. The process is a type of Chine colle which translates to Chinese gluing. 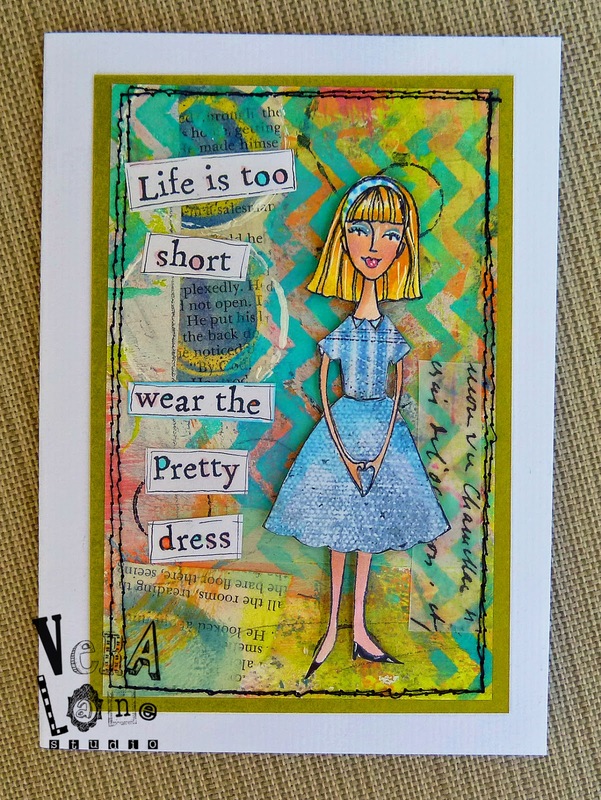 I printed the quote using Stamping Nico with is one of my favorite fonts to use with my handmade cards. Verdette is stamped with StazOn and clear embossed. I used dye ink to stamp her on scrapbook paper to piece her dress. Verdette stands above the Chine colle surface with silicon dots. Thanks for stopping by. You can also find me on Facebook. 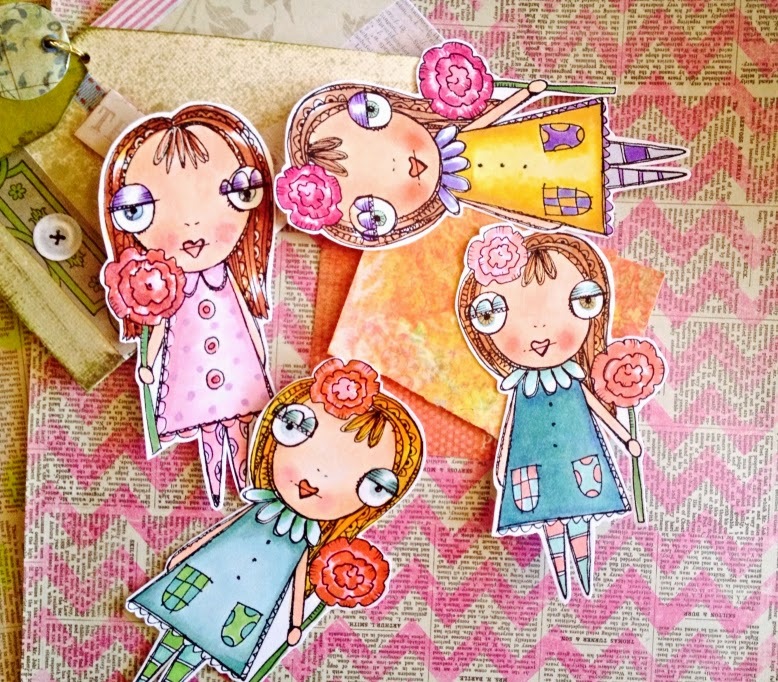 Blossom is a whimsical little miss ready to bring a smile to your crafting table. She comes with two flowers, a grass patch, butterfly, and two quotes. Repeat the flowers, reverse, and overlap. Stretch the grass patch, widen, and layer. Whether you create a lush butterfly garden for Blossom or simply use her alone, my set is designed to give you possibilities to use again and again. 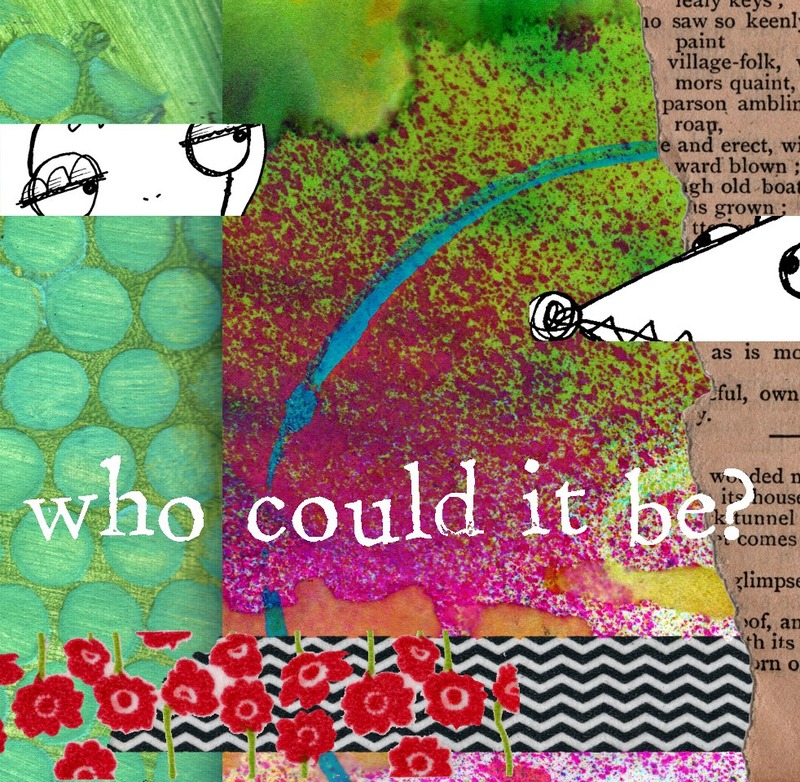 Blossom and other quirky and whimsy characters are exclusively available at my Etsy Shop. 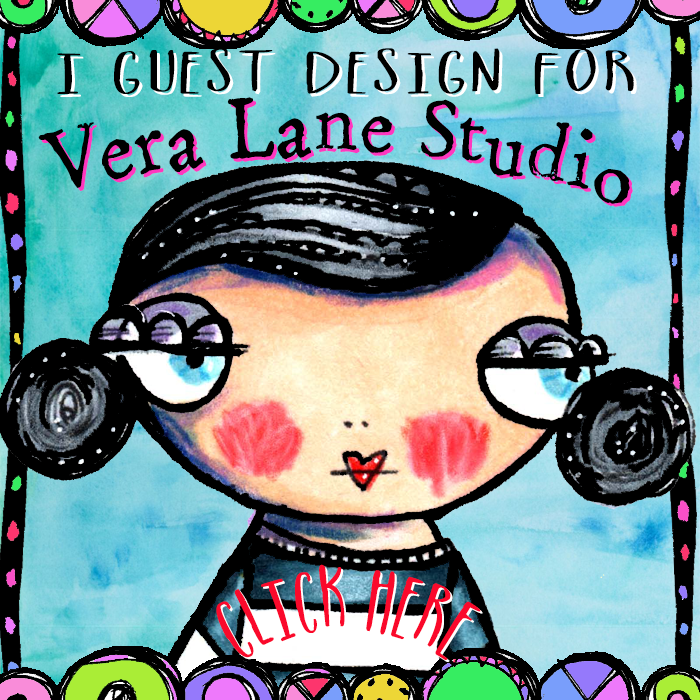 Like Vera Lane Studio on facebook for new image updates and samples. 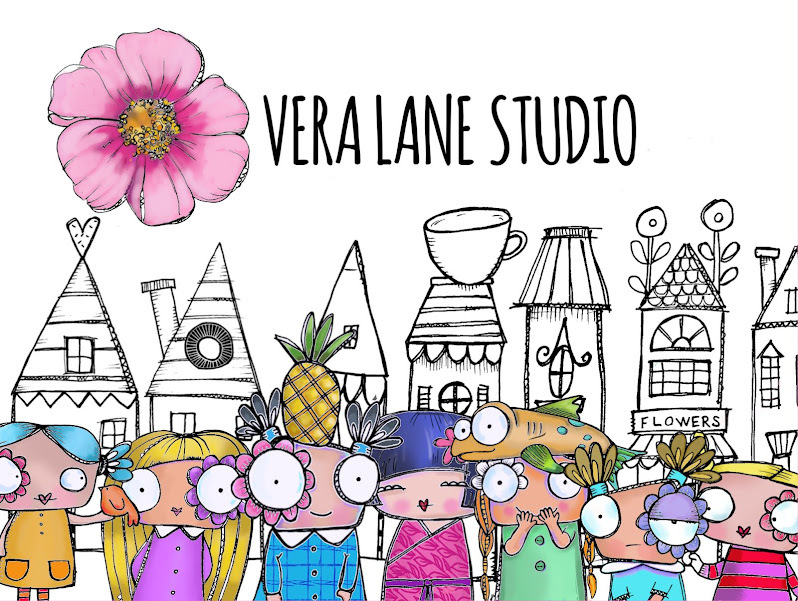 Please feel free to upload your art using Vera Lane characters. It's been five years since I lost my Dad. He was a real Renaissance man and instilled my love for art. In honor of my dad and fathers everywhere, I am offering a buy one get one for this week in my Etsy shop. Purchase one image this week and email me your requested free selection. The father's day set comes with three quotes. In addition to the one in the display, "the heart of a father is a masterpiece of nature" and " Any man can be a father but it takes someone special to be a dad." Use the widget to the left of my blog to enter my Etsy shop. I'm guilty of ripping my sweet husband off when it comes to cards. I make cards for him in a slipshod manner, fast and easy. But fun. 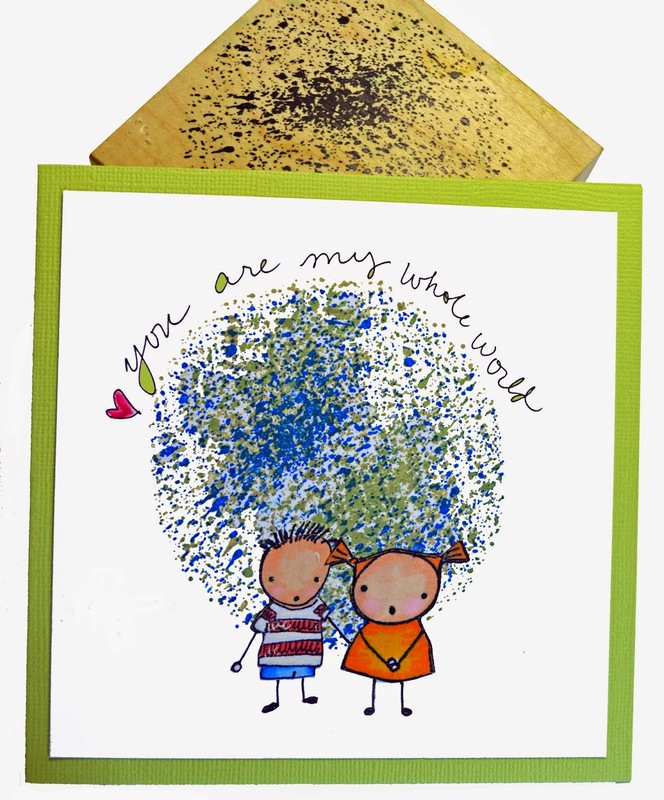 My abstract world is my Splatter Circle stamp by Stampotique. It's the perfect circular splatter without the mess. To make the world image I used a combination of blue, green, and saffron dye inks. I rotated the stamp with each color application to give the illusion of water masses and continents. clipped off her wings. These little ones are part of a collection. Albeit they are simple, they are fun to alter and dress up. City girl is new on Vera Lane. She holds her purse and shopping bags wearing a stylish coat and leggings in typical Vera Lane fashion. She can be used alone or with the four buildings that can serve as a background. City girl comes with a cafe, a dress shop, a tall house and an apartment building to mix and match. 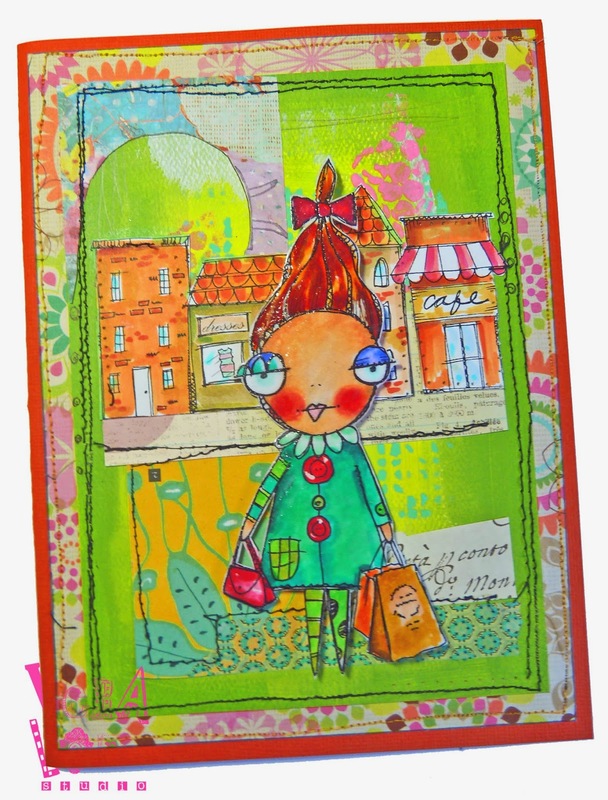 Visit City Girl and other whimsical images at the Vera Lane Studio Etsy shop.